This article will detail the process of deactivating a user and replacing that user's license with the new hire's credentials. First, open the Windows Administrative Tool. If you do not have the Windows Administrative Tool, you can download the Windows Administrative Tool here. First, we will deactivate the user who no longer needs access to the system. Highlight the user you'd like to deactivate and click Deactivate. Deactivation of a user is as simple as clicking the Deactivate button, but note that once a user is deactivated, their login is no longer available for lookup searches (Time Entries Report, etc.). However, deactivation does not affect any record data, so the firm will still be able to bill time or see that that user created a record. Second, we will create the new user. 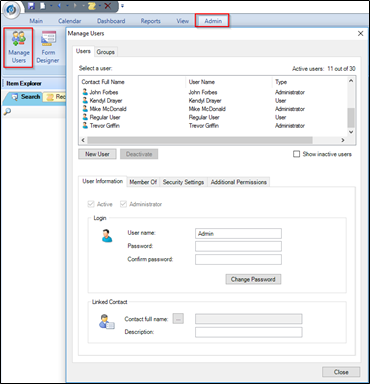 In order to create a new user, your user count located in the top right corner on the Manage Users window needs to be lower than the total users available. Example: 29/30 users means you have 1 unused user license. Click New User located on the Manage Users window. Create a User Name and set a password. Make sure that the Contact Full Name field located in the Linked Contact Area is empty. Click Change Password to save the new user. From here, you can set the correct security for the new user.